Choose the best cat condo for your cat. A good quality cat condo provides your cat with her very own private place to hang out and take long naps. A condo can also fulfill multiple functions such as gym and playpen. So how do you go about choosing the right condo for your cat? Below you will find several pointers to keep in mind during the selection process. Is your cat big and heavy or small and slender? Cat condos come in different sizes. The right condo should provide enough room for kitty to be comfortable. Indeed, it should provide your cat with ample space to move inside. So make sure that you select the correct size condo for your feline friend. Good quality furniture is made of long lasting materials. The ideal condo should be made of sturdy, durable and easy-to-clean materials. A well-made condo will definitely last you longer and save you money in the long run, as you won't have to replace it so soon. Some cat condos are made of pressed wood and plywood. Covering materials include carpet, faux fur, and faux fleece. Also, you can find condos made of washable materials. Kitty condos come in a wide variety of shapes, colors and materials. You can certainly find one that matches your home décor. You can find cabanas, caves, and even “palaces”. There's something to please every taste. There are oval, round, and square condos. There are also cat tree condos and kitty towers. Some cat condos even come with platforms, ramps and scratching posts. These types of condos provide lots of areas for kitty to play and sleep in. There are also one-story and multi-level condos. These pieces are great for households with multiple cats. See below for additional information about different types of condos. To avoid accidents, a high-quality condo must be strong and stable. Choose a condo with a wide base to prevent it from tipping over. This is particularly important if you decide to buy a combination of cat tree and kitty condo. You can find condos in the market that are made of washable, easy-to-clean materials. You can also find high-quality condos made of stain-proof materials. Choose a condo with plenty of scratching surface. You can find condos that come with "extras", such as tunnels and toys. If your condo doesn't come with toys, you can attach them yourself. Kitty will love them. There are different types of condos. These pieces can be elaborate or simple. Generally, the basic cat condo consists of an enclosed cube with an opening or door. There are, however, more elaborate, multi-level kitty condos. Many even serve multiple functions, such as gyms and climbing toys. Here's a list of different types of cat condos. This type of cat furniture is excellent for the active cat. Playpens are fantastic for young cats as they are naturally active and can have lots of fun playing and exercising. Many playpens come with different sections, at different levels. More importantly, these pieces come with condos and/or cradles for cats to sleep in. Some cat condos are a little more elaborate and come with play areas. Gyms allow your cat to exercise and have fun at the same time. Cat gyms are a great option for young, active cats as well as for multiple-cat households. We all know that cats enjoy climbing and favor high places. Always make sure that the piece you choose is stable and sturdy to prevent accidents. This is another good option for households with multiple cats. This type of furniture offers lots of fun for your kitty. Most cat trees come with several sections at different heights. Many cat trees also come with a cat condo or cave, usually at the base of the tree. For additional info, visit our cat trees page. If you have a cat that spends a great deal of time outdoors, then a cat house is a wonderful option. Cat houses provide a safe spot for your outdoor cat to sleep and relax in. This is a good idea for those rainy and cold days. Make sure the house you buy is especially designed for outdoor use. 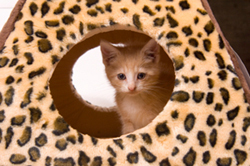 A pet house is a great option for indoor cats as well, especially for cats that like a quiet spot. For indoor cats you can find plastic and plywood pet houses. Most of these cat houses are lightweight and easy to store. For more information visit our page about cat houses. ... You can find wonderful, one-of-a-kind luxury condos. Most of the designs come in different sizes, colors and materials. You can certainly find the perfect design that will match your furniture and will seamlessly blend in with the rest of your home decor. I hope that the suggestions presented here help you find the best cat condo for your cat or kitten.